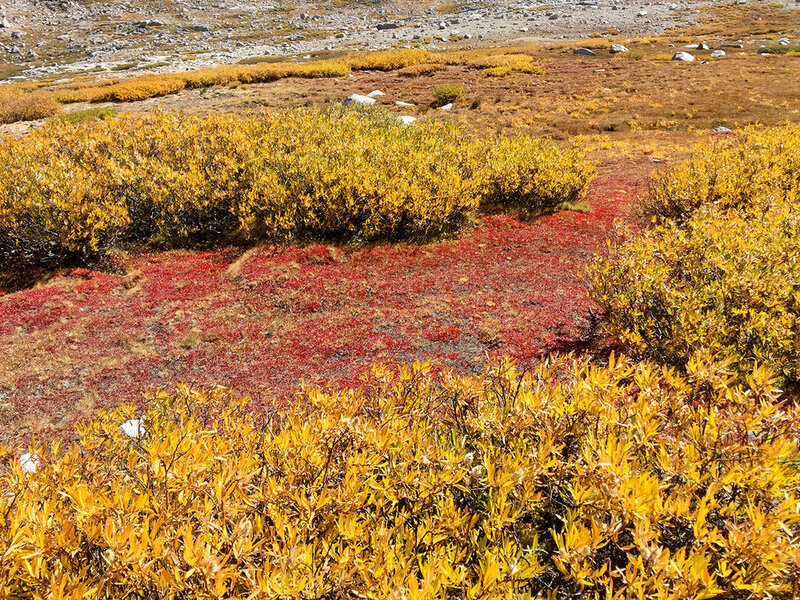 I follow a portion of the SoSHR (Southern Sierra High Route). It is a loosely defined route involving scrambling and orienteering where you make your way off-trail through basins and over passes. It is physically and mentally exhausting but offers solitude and a unique perspective about the landscape. 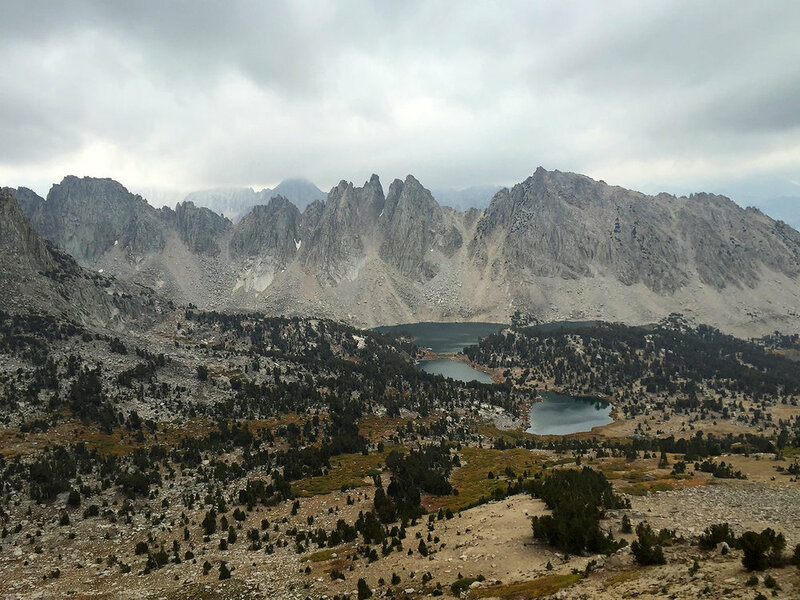 I enter at Kearsarge Pass in the North on September 23 and exit at Cottonwood Lakes in the South, traveling cross-country for a total of ten days and 66 miles, visiting six 14,000 ft peaks (14ers) along the way. The 14ers visited, in order of visit from back to front, Mt. Tyndall, Mt. Williamson, Mt. Russell, Mt. Whitney, Mt. Muir, Mt. Langley. I always enjoy opening up the Audi on the drive north. Los Angeles to Lone Pine: 140 minutes. Speeding, basically. I pick up my permit in Lone Pine just before the office closes at 4:45 with the intention of camping at trailhead to acclimate to the high altitude. However the prediction of rain easily persuades me to spend the night in Lone Pine instead. I walk the back streets and get this view of my impending destination. Lone Pine Peak is in the front, Mt. Whitney is the orange one more in the rear to the right. "Lone Pine Kurt" Kurt Payer shuttles me with my car between my beginning and ending trailheads. (lonepinekurt@aol.com). He told me he still feels guilty about dropping me at South Lake several years before, just before a storm came in. I told him that it was actually a glorious "white" way to start a nice trip, you can read about it here. So I start at Kearsarge Pass, not my favorite pass, but it is a quick way to get into the high country. 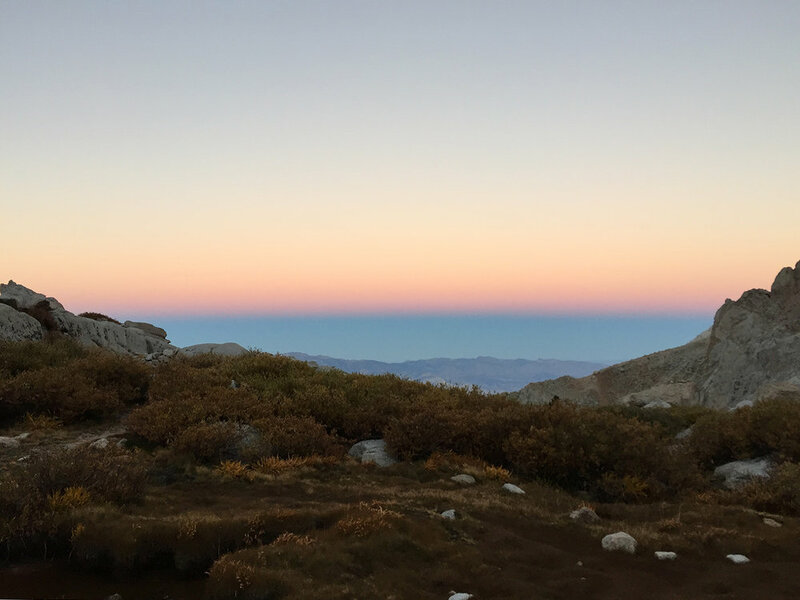 I meet two guys at the top who are fuming about their two-day late JMT resupply that finally shows up while I am there, and they later make some noise about it on the Yahoo JMT site. I also meet a guy sporting a can of bear spray, he tells me that "you never know when a bear is having a bad day". 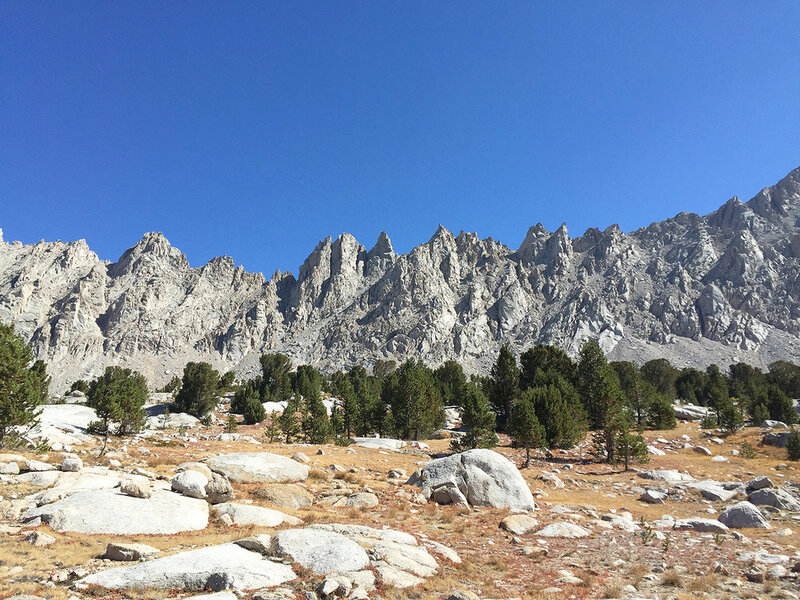 I drop into the valley and turn left to join the JMT briefly and to look for the off-trail exit to the Center Basin area. The next day up Center Basin is brisk. I encounter four rangers who are counting fish caught in a net as part of a frog habitat restoration program. In fact the only people I encounter for two days are rangers. Center Peak looms the rear. The toothy east side of Center Basin. On my way up to Junction Pass I spot five pack animals with one leader making their way down from Forester Pass on the John Muir Trail. Apparently my eyes are much better than the resolution of my iPhone camera! At the top of Junction Pass, Mt. Williamson is seen on the left and Mt. Tyndall on the right. To get there there I will have to descend down 2,000 feet of nasty scree and talus, climb through brush, and then climb up Shepherd Pass. I will arrive at the base of Mt. Tyndall late morning the next day. Beautiful sunset camping at Shepherd Creek. It is aggressively cold. I burrow deep into my sleeping bag early evening to read from my iPhone. I place my tarp so as to receive the first morning rays of sunlight. I normally sleep under the stars without a tarp, but it is too windy. It takes more than hour to climb down through bushes and garbage talus to connect with the Shepherd Pass trail. Another ranger encounter, doing trailwork on the infamously bad Shepherd Pass trail. Four embedded rocks constitutes most of a day's work. The rangers see my climbing helmet and caution me that two climbers died that week. I make it to the base of Mt. Tyndall and climb up the so-called "black-rib" Class 3 route. 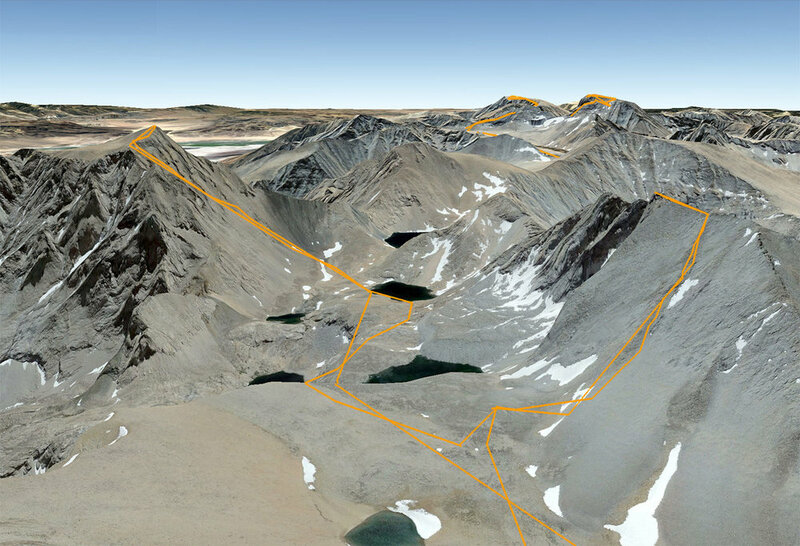 This Google Earth view shows my GPS tracks up Mt. Tyndall (14,025 ft) on the right and the route through the "Williamson Bowl" and up Mt. Williamson (14,379 ft) on the left. I test my almost new La Sportiva TX3 approach shoes. An approach shoe is a hybrid that allows for long hikes but has some attributes of a classic climbing shoe with features like "sticky" rubber soles. They work well. Very sticky. The view up, sticky shoes appreciated. The register at the top is a small aluminum canister. Two hours up, 75 minutes down, an easy ascent. I stake my tarp hard to the ground to resist the strong wind and to be able to light my Esbit tablets. The tarp makes a lot of noise flapping during the night, and a corner stake breaks leaving me with a wildly flailing tarp at 2 am. The next day I make my way across the Williamson Bowl at 7:30 am, with the striking southeast face of Mt. Tyndall in view. Along the way I meet four engineers who work for Scaled Composites in Mojave, and we travel together from there up Mt. Williamson. 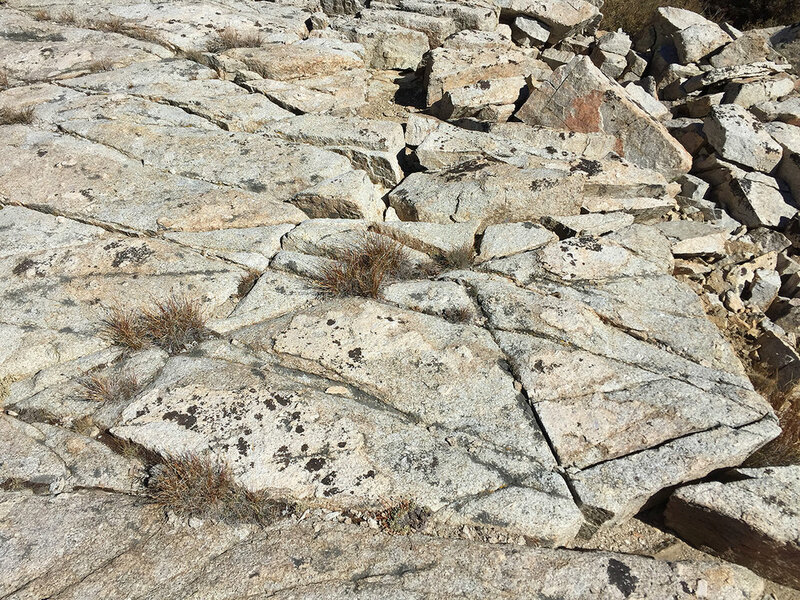 The chute is a typical mixture of scree and rocks. Photos often do a poor job of communicating heights; this is fairly steep. There is a 20 foot chimney at the top that has lots of holds and feels enclosed and safe to me. However at the very top that there is a small section that is more exposed and apparently some people choke at that point and turn back. The next day near the Wallace Creek area I encounter an unexpected stream/rock feature. I camp at treeline just below Wallace Lake. Yes, those are dead trout left by anglers who don't know how to properly Catch and Release. I have to guess where to make my way up the steep mountain. That small dip on the left seems promising. The last pass was a bit puzzling, but this one is more extreme. There is NO WAY I am going to make it up this steep rock wall. But there is no alternative, so up I go. At 12,900 feet the legs say go go go, but the body keeps saying wait wait wait. It takes me a ridiculously long time to climb this pass, and as I am running out of energy, supplies and time, I decide to end this portion of the trip once I make it over the pass. I leave Tulainyo Lake below. Once I make it to the top however I am energized by the sight of Mt. Whitney and so I decide to climb up the east ridge of Mt. Russell (14,094). It is far more vertical and exposed than the other mountains, and is frankly creepy, reminding me of falling nightmares I sometimes have. I am keeping my act together, but this is the edge of my comfort zone. They say that Class 3 climbing is like climbing a stair without a handrail on the side of a skyscraper, and Class 4 is like climbing a ladder on the side of a skyscaper. I am OK with free-climbing Class 3.9999, but this feels like more. "This route will get your attention. I've done my share of 14er ridges, and Mount Russell was by far the stiffest, most exposed class 3 route I have ever experienced. 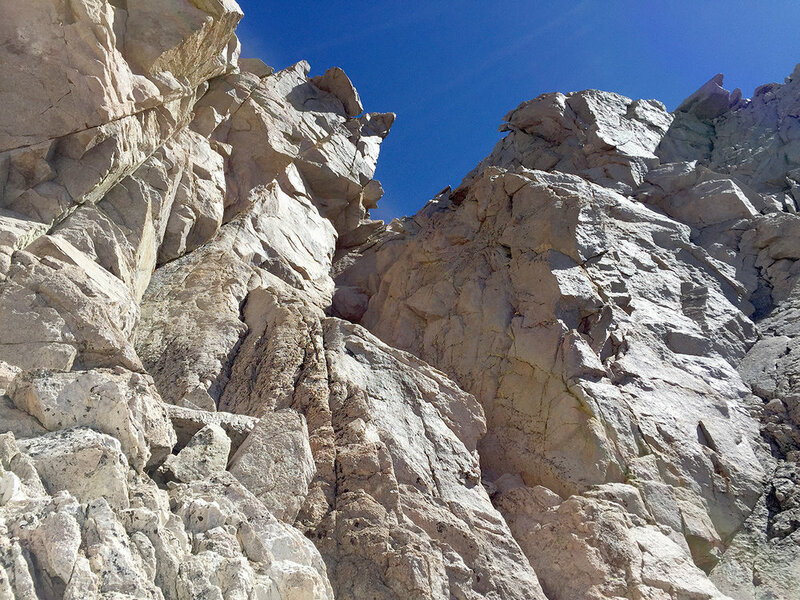 Once you wrap your mind around the fact that some of the moves are going to put you on some vertical rock with a lot of air under your feet – but with cracks big enough to stuff your entire hands and feet into – you'll be just fine! OK, enough for today, time to descend. Just do not look down. 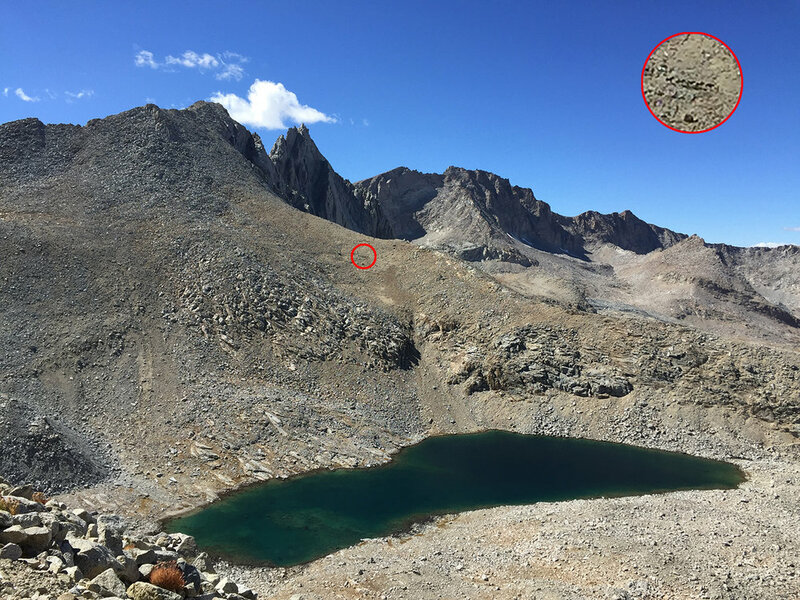 I descend 2,000 ft down a very steep scree field to Upper Boy Scout lake where a few people are setting up tents and preparing for morning ascents. 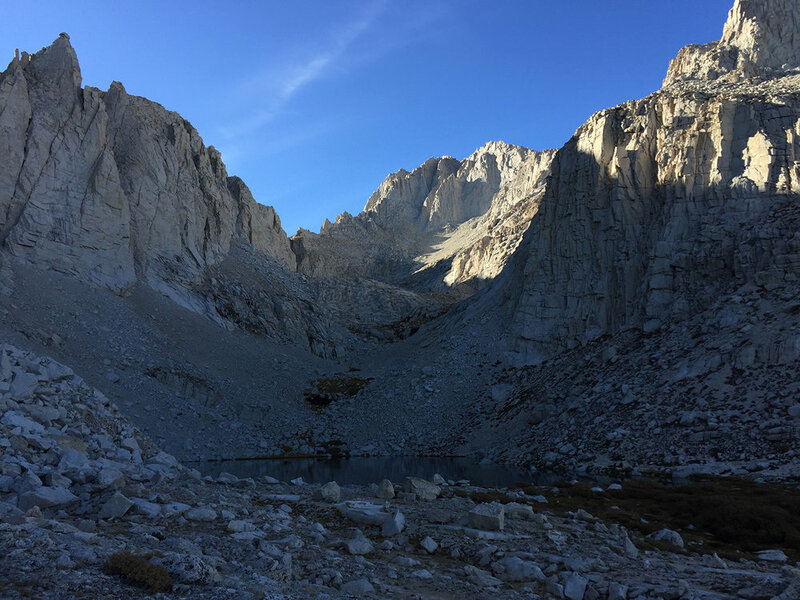 I discuss the Mountaineer's Route with a few people and it sounds doable, I believe that I can make it down to Whitney Portal in the dark and with some luck I might be able to hitch to Lone Pine that same night. I am emboldened by my new 100 lumen headlamp that puts out just enough light for nighttime trail navigation. I start descending at 6:30 pm, and it does not go well. I keep losing the poorly marked trail, and am climbing through bushes on hands and knees and across rock ledges. I have one GPS track on my iPhone and I can see from the squiggly lines that whoever created that track also got lost and retraced their steps over and over. By 10:30, four hours later, I can see some lights and know that I am getting closer to my destination, and then disaster strikes: my light goes out. In my distracted state I forgot that my new headlamp will only give me high power 100 lumens for four hours. I am stuck on a vertical rock, no moonlight, and have no choice but to sleep on the narrow ledge and wait out the night. I sleep on the dirt area next to my pack, with the small bush as partial insurance to not roll off during the night. I learn later that this stretch is called the "Ebersbacher Ledges" and there have been fatalities here. The next morning Kurt is available to transport me to Lone Pine, but I have to wait until the afternoon to go fetch my car at Horseshoe Meadows, so I have time to kill, eating the mandatory post-trip big lunch at the Alabama Cafe. 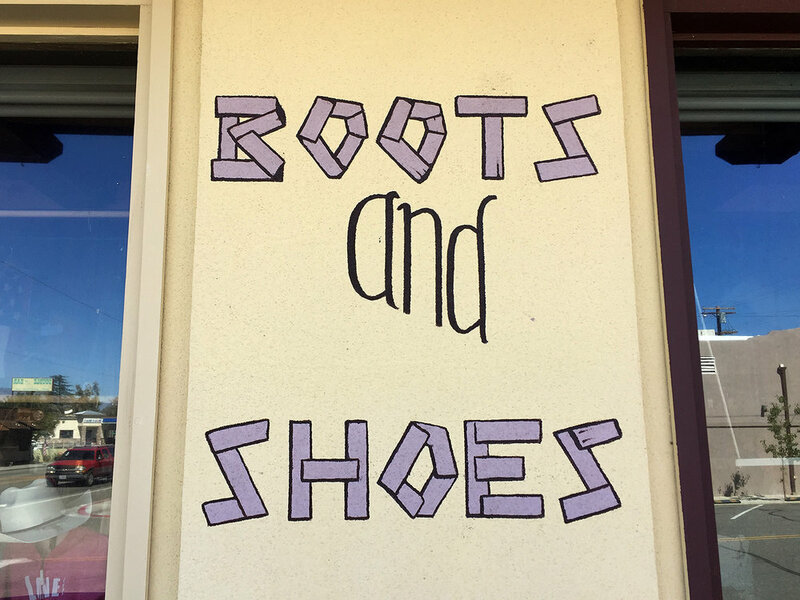 Lone Pine has a lot of old-fashion expressive typology that I photo-document. It is a nice afternoon, surprisingly warm, and I am looking forward to a few days rest before returning to the route. Ten days later I return to Lone Pine to find clear skies. This is going to be good, I am excited. Kurt is not available to shuttle me but Paul of East Side Sierra Shuttle is (paul@inyopro.com), and off I go. Well, going up the Mountaineer's Route during the day is easier for sure, but it still is a poorly marked trail with many false turn-offs. I contracted giardia on the last trip and nuked it with antibiotics two days ago. I don't feel anything bad from the antibiotics, but the skin peels from my hands and feet. 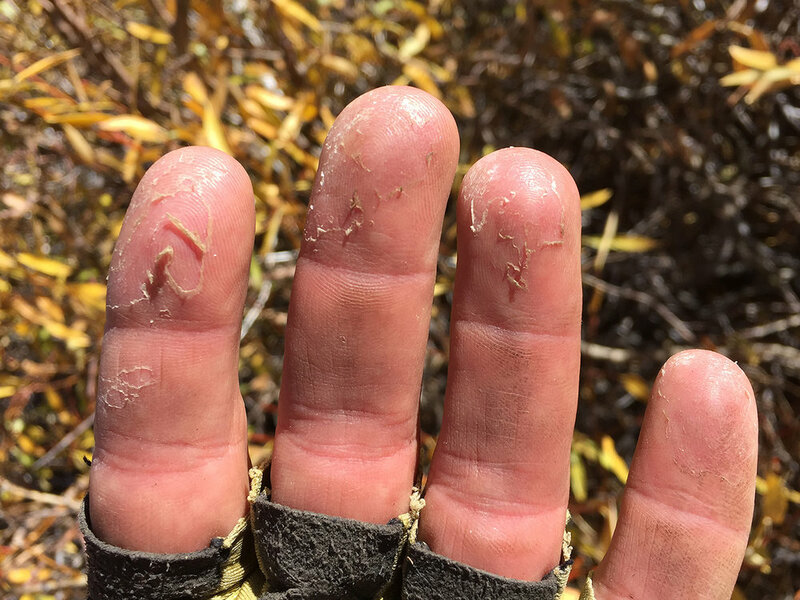 Early October offers yellowing Aspens on the trailheads. There are some places on the trail that other hikers marked as false turns, and some cairns exist, but they are not enough. Ah yes, the Ebersbacher Ledges where I spent the night a few days before. I choose to take a high path that avoids the bushes and stream. At some point I change my tack and head back down, the ice is too slippery. I walk by Upper Boy Scout Lake. I am full of optimism and I notice that the high altitude is beginning to make me light-headed, in a good way.